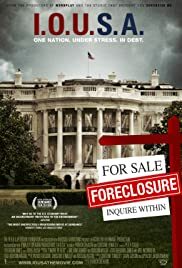 BEFORE: At long last, my 17-film, 16 day chain of documentaries comes to a close with today’s look at the United State’s financial troubles in I.O.U.S.A. I’ve been learning a lot in the weeks leading up my return to college and it will be fun to get back into some action and drama films again. But for now, it’s time to learn how these crazy filmmakers think our economic problems can be fixed. AFTER: What I liked about I.O.U.S.A. is that it takes a historical and political look at our nation’s financial problems rather than focus on the effects of the recent recession which has been covered to death over the past few years. While the documentary did a good job presenting the problem (read: America is in big financial trouble) it didn’t do as good of a job presenting possible solutions to said problem. The choice quote of the documentary is, “This is America. We don’t do anything unless it’s a crisis.” I think that is absolutely true. The issue is, this is a crisis and we still haven’t done much about it. It’s not enough for the documentary to reiterate that we’re in trouble. It needs to, as it’s plot description states, “explore… ways to avoid a national economic disaster,” and I.O.U.S.A.failed to do that. The information was presented in an easy-to-follow way and revealed quite a bit about our country’s financial history. But I can’t get over the fact that the advice given on how to solve the problem boils down to, “Yeah, just do some things differently and, you know, stuff should get better.” When you have access to top economic experts, the explanation should be more complex then what a grade-school kid would think of. We know things need to be fixed; it’s the economist’s job to tell us how.